According to Brad Cornell of Audubon of Western Everglades (AWE), a serious violation of Florida wildlife protection laws occurred on Marco Island on Wednesday to an active burrow with a pair of burrowing owls. 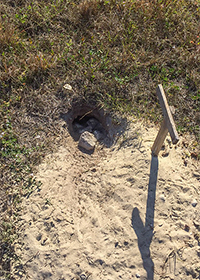 A monitor for AWE’s Burrowing Owl Watch Project contacted Florida Fish and Wildlife Conservation Commission (FWC) to report that someone had filled an active burrow with rocks. FWC Law Enforcement officers, Marco Island Police, Marco staff, and two Audubon biologists responded to the call immediately. The primary concern was whether any eggs, baby owls or adults had been entombed by the rocks because this is nesting season for this species. Audubon biologists used an extendable camera to scope the burrow but could not get around a curve so we don’t know yet whether any eggs, or chicks were killed. While this investigation was going on, a second call came in from another neighborhood about a couple who appeared to have buried an owl by filling its burrow. The owl excavated itself, and the neighbor called law enforcement. Audubon is concerned that some members of the public have a misunderstand that having the owls on their property hampers their ability to build a house or sell the lot. According to Brad Cornell, a common reaction is perceiving the presence of burrowing owls and other protected species such as gopher tortoises, as a threat to their property. Audubon of the Western Everglades’ understanding is that their “protected” status does not mean you cannot build a house – it means that a permitting process from FWC is necessary and there is no need to harm the owls. Filling in burrows, burying eggs, chicks and adults are harmful act and Illegal acts. Most of Marco Island’s residents cherish the charismatic owls and have been very helpful to Audubon’s Owl Watch monitors by reporting threats as well as keeping a watchful eye on their neighborhood’s burrowing owls. There are currently 218 sites on Marco, with about 450 adult owls. AWE has 20 owl monitors with 10 managers who weed whack sites during the non-nesting season. The Marco Island population is one of the largest for this threatened species in Florida. 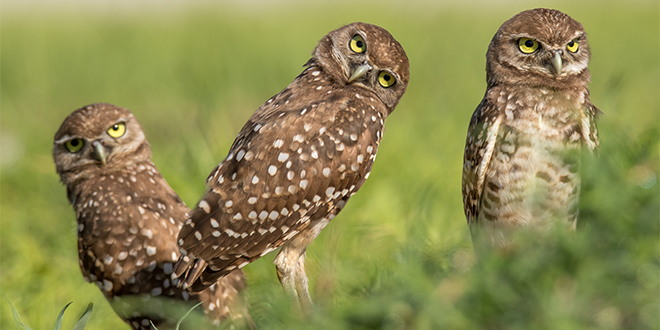 Please Note: Burrowing Owls are Protected by the Migratory Bird Treaty Act; Florida Endangered and Threatened Species Act and City of Marco Island’s Protected Species Ordinance.